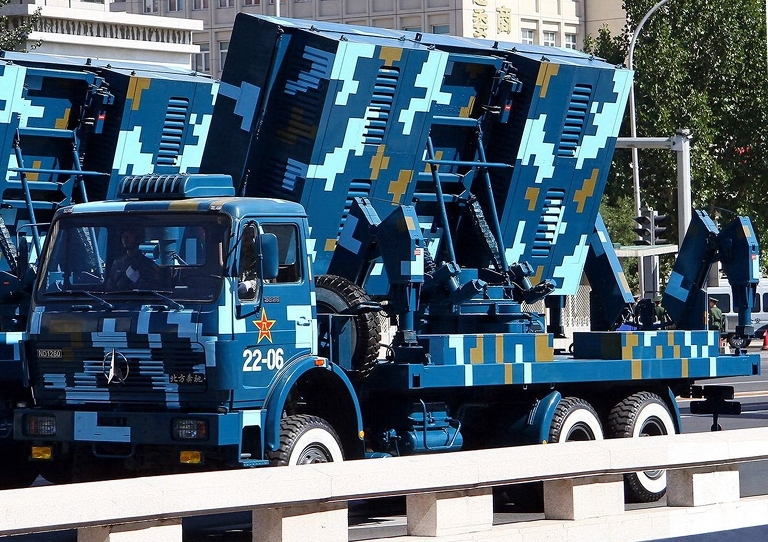 Left: HQ-12/KS-1A TELs and H-200 engagement radar; right: HQ-9 TEL and HT-233 engagement radar (via Chinese Internet). 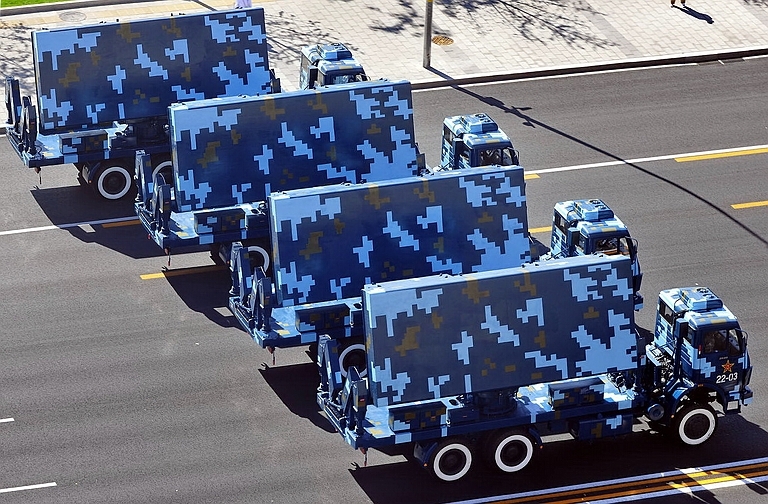 China's recent 60th Anniversary National Military Parade produced a number of interesting disclosures, including the first public viewing of the complete components of the HQ-9/FD-2000 and HQ-12/KS-1A SAM system batteries. While the HT-233 and H-200 phased array engagement radars have been well exposed previously, the parade did yield plentiful high resolution imagery providing a more accurate perspective on these important systems. Much more interesting, however, was the first public exposure of three new self-propelled battery acquisition radars associated with these systems, the Type 120, Type 305A and the Type 305B. While two are derivatives or variants of existing acquisition radars, one is entirely new and hitherto unknown to Western analysts. Another important observation is that all of the components of the HQ-9 and HQ-12 SAM systems are designed from the outset for hide, shoot and scoot operations, to maximise opportunities to evade SEAD/DEAD tasked aircraft. 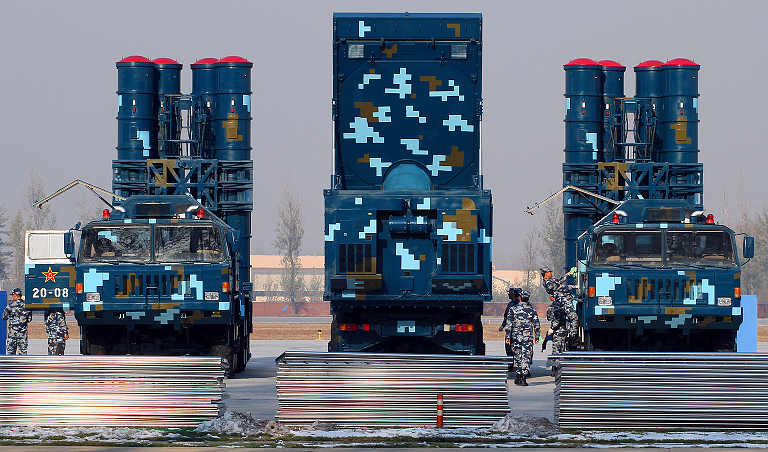 This is an important advance for the PLA IADS, which even a decade ago relied primarily on the static HQ-2 Guideline system, typically operated from fixed semi-hardened SAM sites. 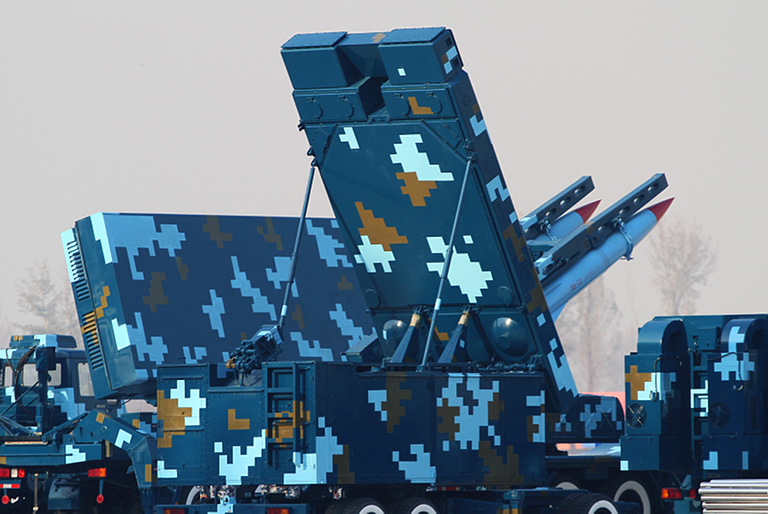 With the PLA IADS now replacing HQ-2 batteries with a mix of HQ-9, S-300PMU/PMU1/PMU2 and HQ-12, the SAM force has wholly transitioned to systems with excellent, if not exceptional mobility, by contemporary standards. 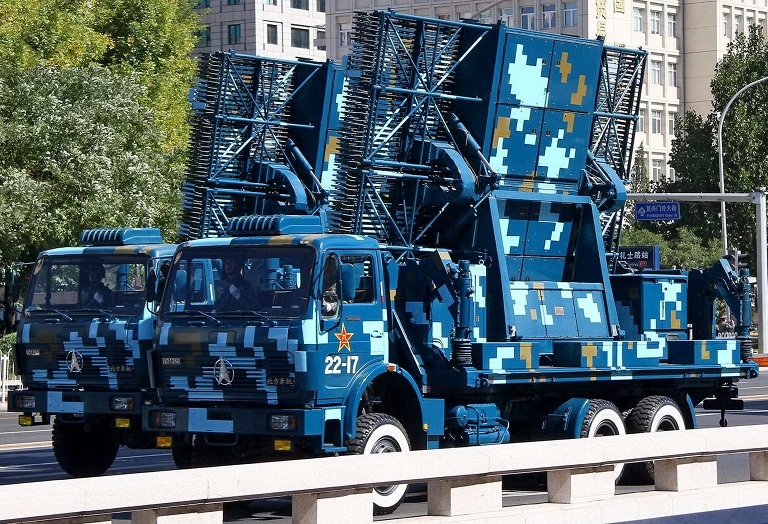 While the HQ-12 TEL has been displayed frequently in public, the HQ-9 TEL has until recently been known only from poor quality Chinese media imagery. High quality imagery shows a design closely modelled on the Russian S-300PM/PMU 5P85SU/SE TEL design, hosted on the Taian TAS-5380 8 x 8 chassis, itself a derivative of the MAZ-543 Uragan/Kashalot. An important difference is the absence of an automatically deployed and stowed telescoping radio datalink mast, requiring a two man crew to deploy or stow the TEL datalink mast. For rapid hide, shoot and scoot operations this will impact the repeatability of stow and deploy times. Sources in Asia claim that HQ-9 battery components can be networked using fixed optical fibre cables, microwave directional line of sight links, or other RF datalinking channels1. 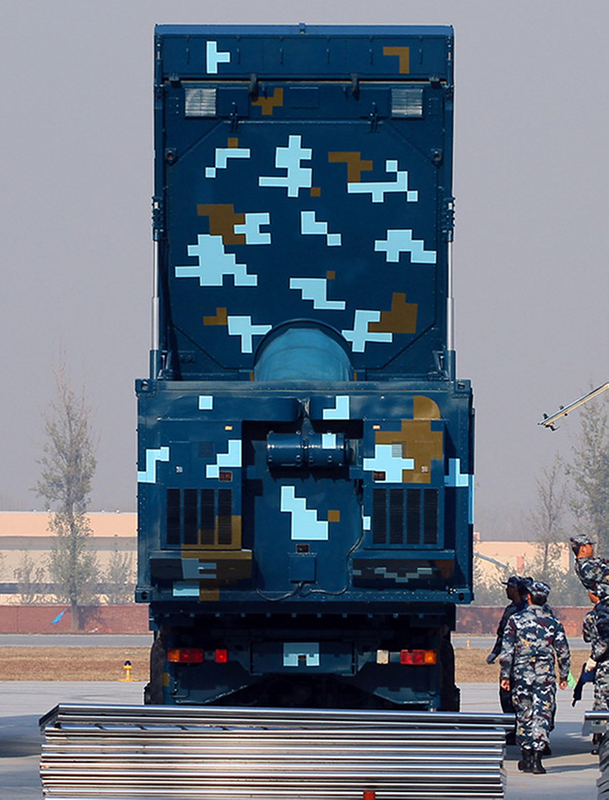 However, until HQ-9 TELs and HT-233 engagement radars are equipped with organic telescoping or folding RF datalink antenna/mast systems, the full mobility of the basic self-propelled configurations employed will not be exploited. Retrofit of such technology, given the availability of extant Russian terminal hardware on 30N6E Tombstone and 5P85TE TELs, is not a challenging task in reverse engineering. Deployed HQ-9 battery. Above, self propelled YLC-2V to the left with its three support vehicles, in the background a HT-233 battery engagement radar. 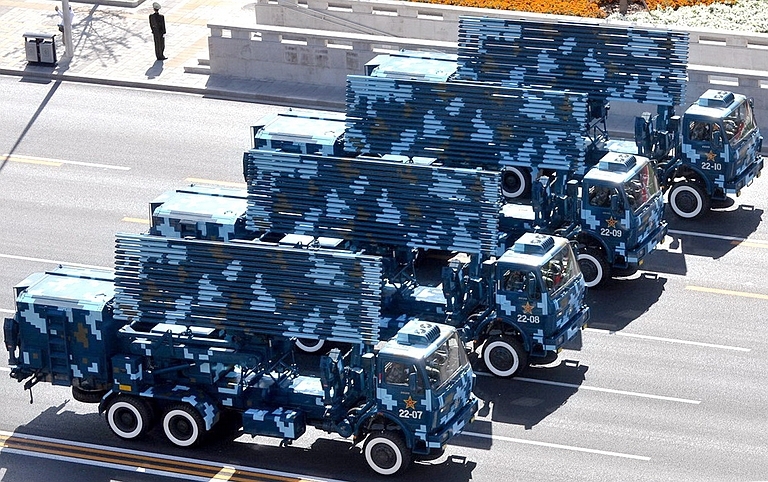 All vehicles employ the “classic” rather than more recent “pixelated” camouflage patterns (via Chinese Internet). 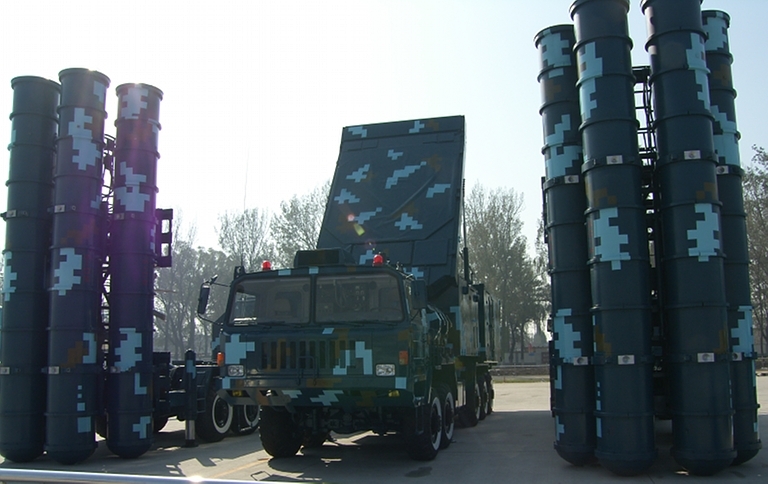 Cited HQ-9 battery composition is 6 four round TELs linked to a HT-233 engagement radar, under the control of a TWS-312 battery command post. Typically four batteries are supported by single acquisition radar, variants of the YLC-2V being most commonly cited, and observed in published imagery. 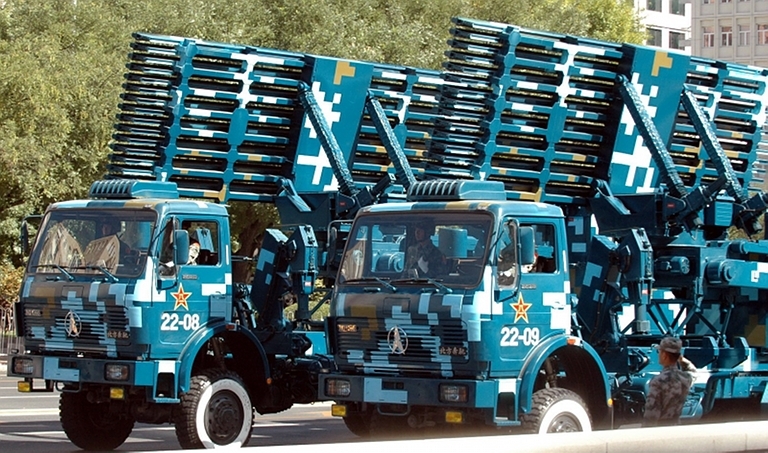 A similar arrangement is likely for the HQ-12 system, with 6 two round TELs clustered around the H-200 engagement radar to form a single battery. To date there have been no specific disclosures on what acquisition radars are employed with the HQ-12, but there are no good reasons to assume that HQ-12 batteries are not supported by the same acquisition radar package used with the HQ-9. Not unlike the HQ-9 batteries proper, the three new acquisition radars displayed are built for true hide, shoot and scoot operations, with hydraulically deployed supports, and hydraulically powered antenna deployment. 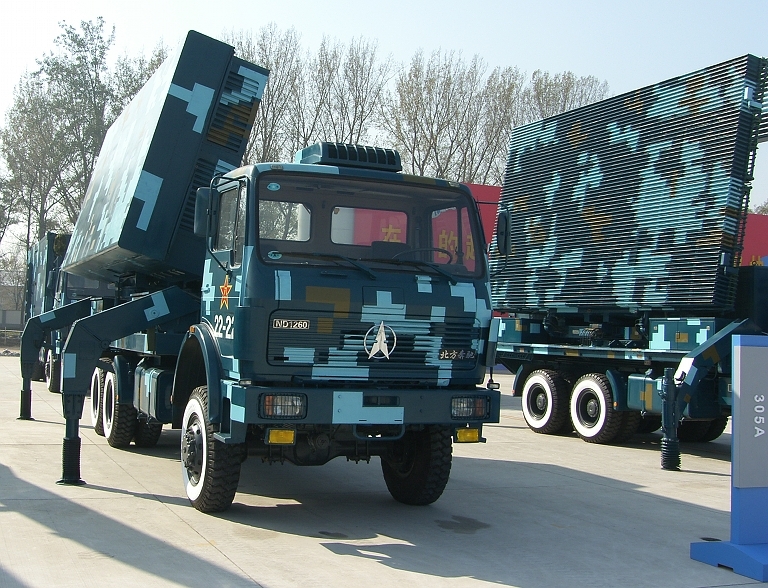 All three radars are carried on the ND1260, a 6 x 6 military variant of the North-Benz / Inner Mongolia First Machinery Group Corporation 2629 series 15 tonne payload truck, which is a legally licenced derivative of the German designed short cabin Mercedes-Benz “New Generation” NG 80 series2. 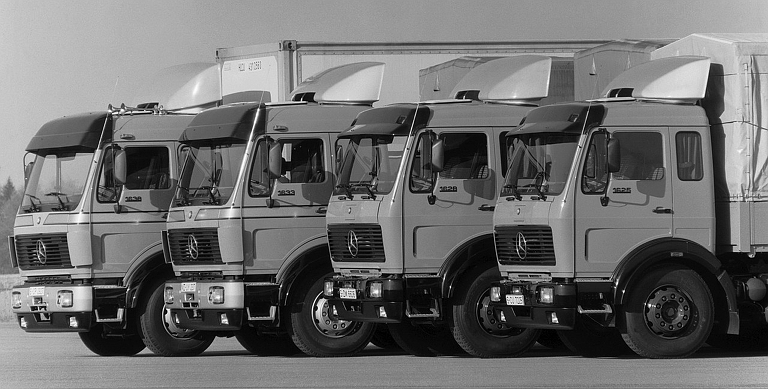 These truck chassis are available with either liquid or air cooled diesel powerplants. The 6 x 6 ND1260 series will not provide the off-road mobility of the HQ-9/FD-2000 chassis, which is based on the Taian TA-5380 series, built by the Taian Special Vehicle Co., Ltd. 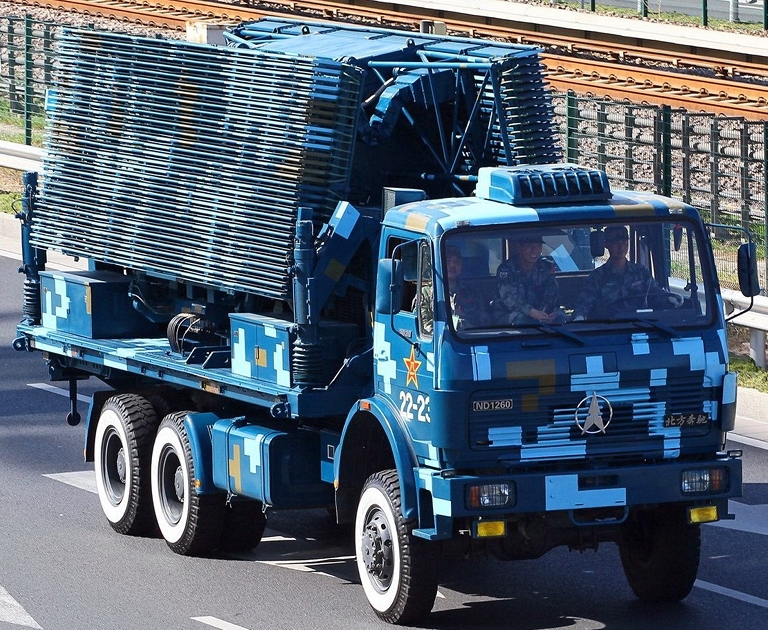 It is interesting that the PLA did not opt to install these radars on the heavier 8 x 8 North-Benz NG 80 military chassis variants, which have better cross country capabilities, and have been used in other PLA military applications. Technical analysis of each of these five radar types follows under individual entries. Above, below: HQ-9 TELs on 8 x 8 TAS-5380 chassis with HT-233 engagement radar (© 2009, Bradley Huang). HQ-9 TEL, stowed. The design closely resembles the 5P85SU (via Chinese Internet). 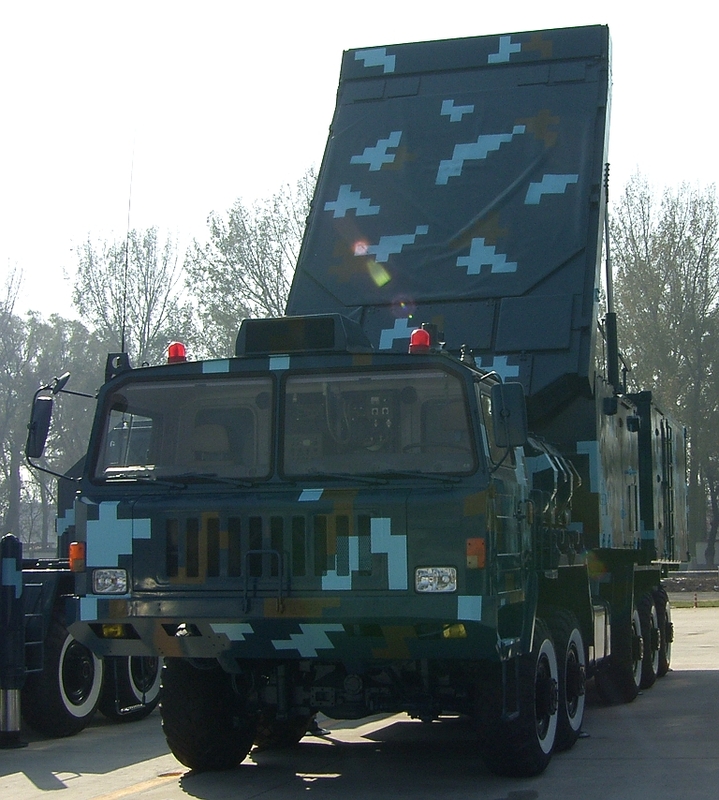 HT-233 engagement radar on the 10 x 10 Taian TAS-5380 series chassis (© 2009, Bradley Huang). The HT-233 engagement radar has always been regarded to be a derivative of the Russian 30N6E Flap Lid / Tomb Stone series, sharing most of the basic technology in this design. Until this year, available imagery was of very poor quality, and showed a range of configurations carried on 8 x 8 and 10 x 10 variants of the Taian TAS-5380 series chassis. 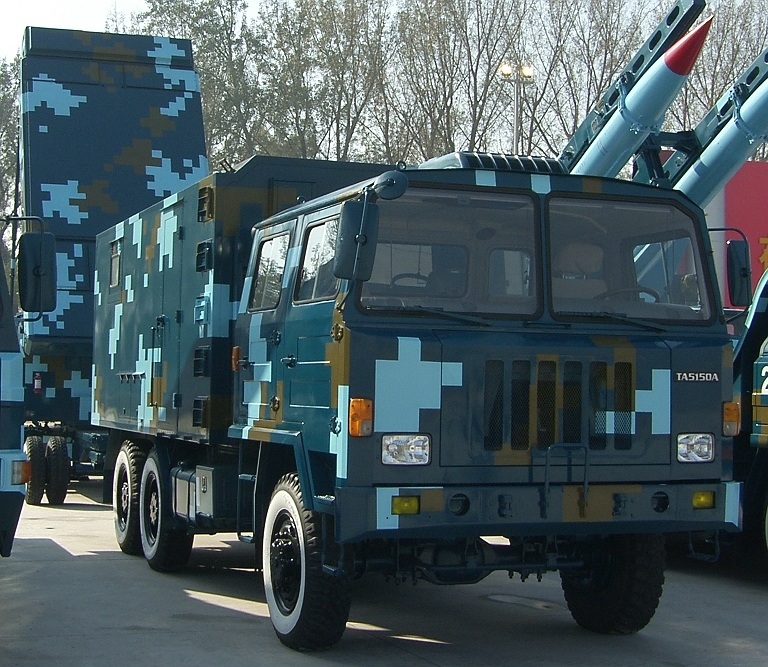 Production HT-233 systems are being supplied on the 10 x 10 Taian TAS5501, a 30 tonne payload class variant of the TAS5380 vehicle, making it the heaviest derivative of the 30N6E. This feature makes the HT-233 easily identifiable with optical or high resolution imaging radar ISR, against the baseline Russian systems. While the heavier chassis may reflect volumetric and weight issues earlier in the design of the radar, it also provides for long term growth in processing capability and power rating, as more recent technology will be more compact and dissipate less. The octagonal or truncated square passive phased array is claimed to employ 4,000 phase shifter elements. 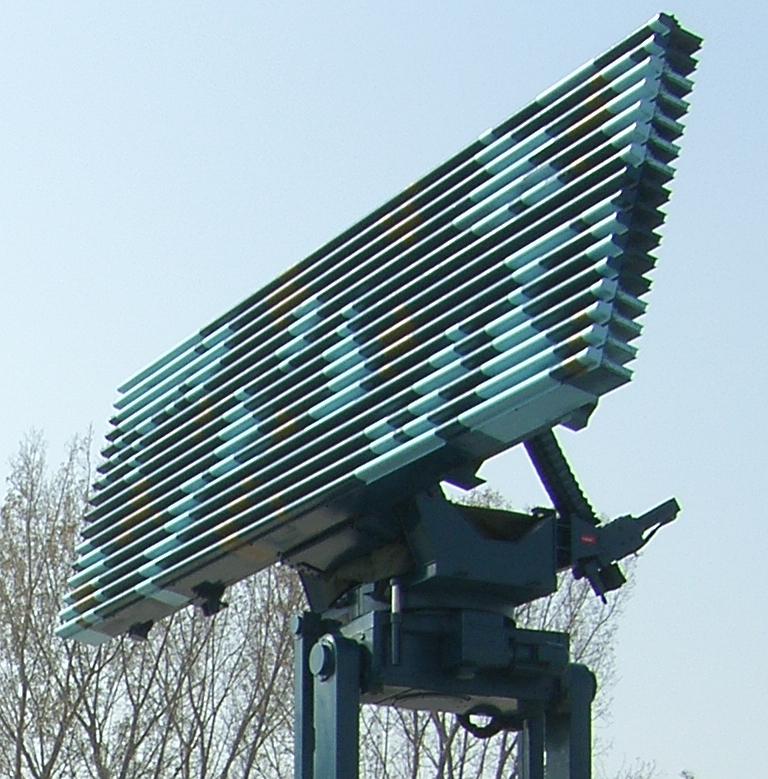 Unlike the 30N6E, the array shape is easily resolved due to the absence of the rectangular dielectric external cover used on the Russian radar. The HT-233 carries an IFF/SSR array antenna installed at the top of the primary antenna frame structure, which is structurally extended. The space feed design appears indistinguishable from the 30N6E1 design, including the mechanical arms used to deploy the feed assembly. Recently cited capabilities include a 300 MHz instantaneous bandwidth in the lower X-Band or C-Band, a detection/track range of 150/100 km for unspecified target RCS, a field of regard in azimuth of 360°, and elevation beamsteering from 0° to 65°. It is claimed to be capable of concurrently tracking more than 50 targets. The radar provides target acquisition and tracking within its coverage sector, post launch missile capture, midcourse missile tracking and command link guidance. Sources disagree on whether the radar provides terminal phase illumination for TVM endgame guidance like the 30N6E series, as the HQ-9 missile round has been also claimed to employ active terminal homing. As the basic missile round relied heavily upon the technology in the late model 5V55 and early model 48N6E missiles, the latter claim may be speculative. An interesting claim by Sengupta is that the HT-233 employs “randomness in frequency, space and time”; if this claim is correct then the HT-233 would be a frequency hopper, employing pseudo-random angular scan algorithms. The latter may qualify the design as having a basic LPI capability, with the caveat that the 300 MHz bandwidth severely constrains achievable LPI effect1. The HT-233 should not be underestimated, as it retains the best antenna design features seen in the 30N6E series, but is likely to evolve unique waveforms, signal and data processing, and modes as the PLA further refines this design over time. The evolution of the J-11B from the Su-27SK presents the case study. Aft view of HT-233 engagement radar showing the octagonal array and monopulse space feed. The design closely resembles the Russian 30N6E series (via Chinese Internet). 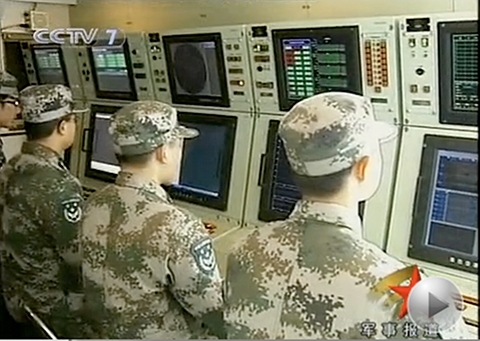 Stills captured from a January, 2010, CCTV7 broadcast discussing the HQ-9 SAM system in operation, show a number of operator consoles in vans used with the system. Notable is the use of state-of-the-art AMCLD COTS display technology, and modern software based synthetic displays and mode selection. This is quite distinct from the CRT technology used in Russian built S-300PMU/PMU1 battery components. 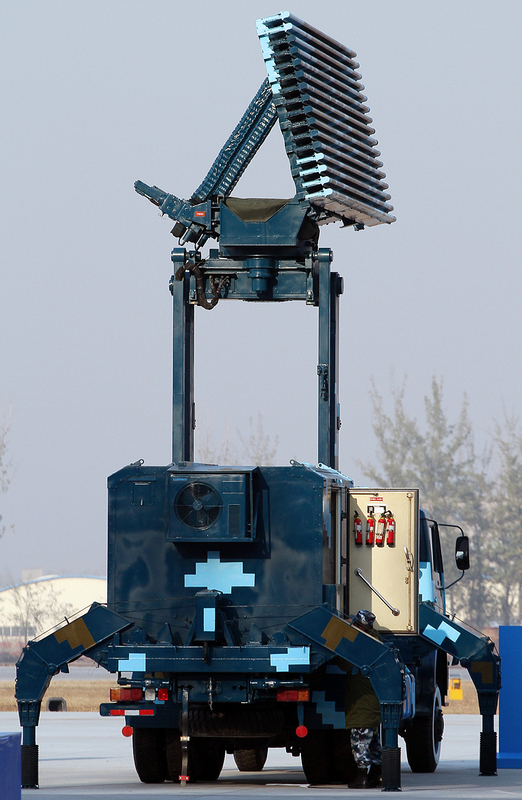 The H-200 system comprises two components, a towed van mounting the radar head, and a systems van (© 2009, Bradley Huang). The design background and history of the H-200 Triumphant Mountain remains undocumented in the West. While high quality imagery of the design has been available for some years, until now images of the rear face of the space fed passive array antenna and the feed have not been available. Imagery showing the HT-233 and H-200 parked together permits the simple observation that the passive array in both radars appears identical in size and geometry, suggesting that the array design used in both radars may be the same, or closely related. The array structural frame is however quite different, as is the antenna feed. Like the HT-233, the H-200 mounts an IFF/SSR array across the top of the structural frame. 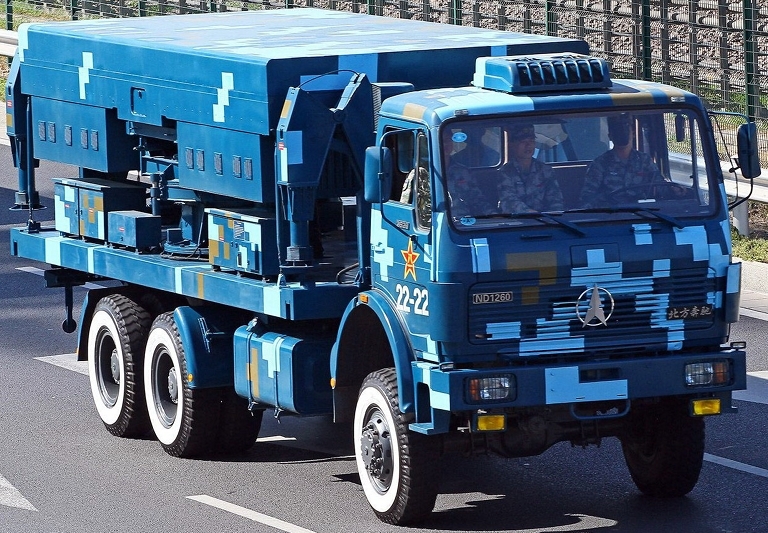 What has not been observed previously is the radar van used to tow the H-200 antenna head trailer, carried on a 6 x 6 Taian TA5150A military truck. While this van design has been photographed previously in proximity to the H-200, there are still no indications of how many vehicles are required for the complete system to deploy. At least two different chassis have been used with the HQ-12 two round TEL, one based on the 6 x 6 Taian TA5270A military truck, the other a 6 x 6 Hanyang Special Type Vehicle Co., Ltd, military truck. As the HQ-12/KS-1A is a command link guided missile, which lacks a terminal seeker, the H-200 will provide target tracking, missile beacon (downlink) tracking, post launch missile capture, and missile command uplink transmission functions. From a mobility perspective, the 20-30 minute stow/deploy times of the HQ-12 are inferior to the HQ-9 and especially the Russian S-300PMU/PMU1/PMU2, they are however much superior to the legacy HQ-2 variants the HQ-12 replaces. Rehosting the H-200 system on to a single vehicle, like the HT-233, and providing mast mounted RF datalinks is neither difficult nor unusually expensive. We should not be surprised if future evolutions of this design follow the pattern of the HQ-9. Aft view of H-200 antenna and space feed arrangement. The design bears considerable similarity to the Russian 30N6E series, but employs a very different antenna space feed. 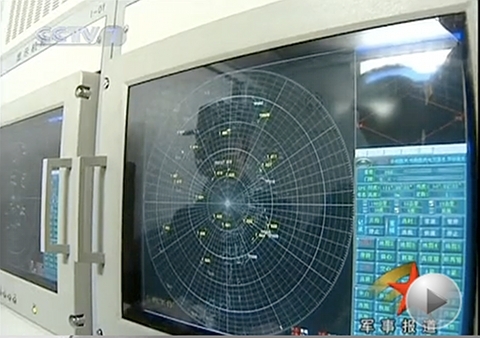 Background: a Type 305A acquisition radar (via Chinese Internet). HQ-12/KS-1A battery components (© 2009, Bradley Huang). 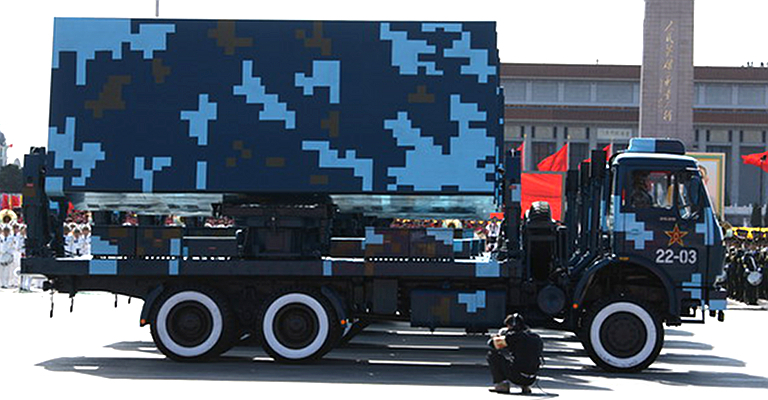 The Type 120 low altitude acquisition radar was not disclosed prior to the 2009 parade. The design appears to be an evolution of the JY-29/LSS-1 series, which itself appears to be a derivative of the extant and widely marketed ECRIEE / CETC JY-11B/ Hunter-1 high mobility low altitude 3D acquisition radar. 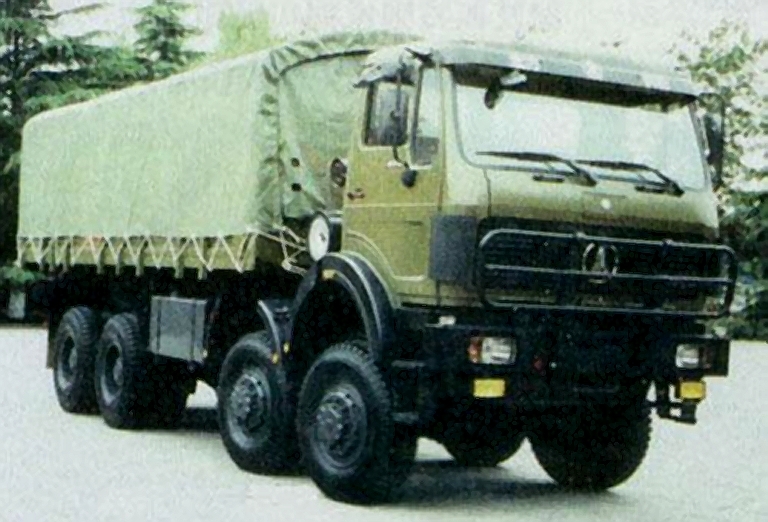 The Type 120 and JY-11B use an identical 6 x 6 truck chassis, equipment cabin, hydraulic supports and accessory housings. The Type 120 and LSS-1 share similar antenna and mast designs, differing in details, but use different chassis and cabins. There are fundamental differences between the Type 120 and JY-11B designs. The hydraulically deployed mast design and its support structure are quite different, with the Type 120 design mast base pivots further from the aft of the vehicle, resulting in slightly lower elevation of the antenna head when deployed. The Type 120 antenna mast and array are much closer in configuration to the LSS-1 design. While the dimensions of the planar array antennas appear identical, the Type 120 has only 16 rows of elements, compared to 32 rows in the S-band JY-11B antenna, at twice the spacing between rows. This indicates operation in the L-band, like the LSS-1 radar, which also has 16 rows of elements. The Type 120 on display was not equipped with an IFF/SSR array, although this function would likely be embedded internally with the primary antenna employed for both channels. In the absence of detailed published specifications for the radar, and detail on peak power ratings, any performance estimates would be necessarily speculative at this time. 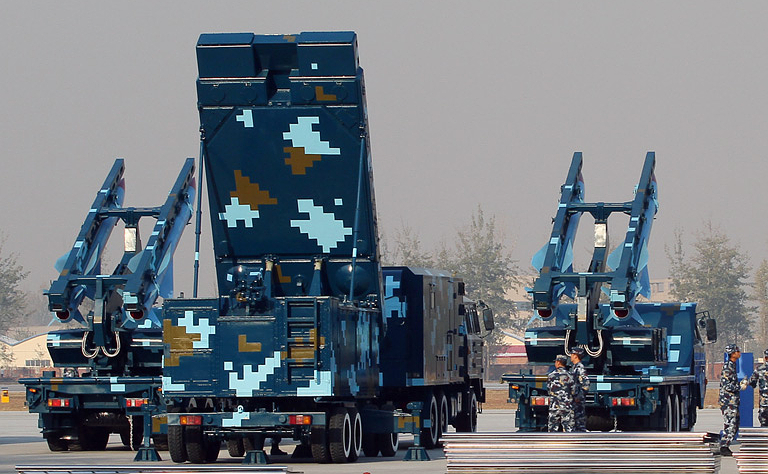 It is likely that frequency scanning is used for heightfinding, as in the JY-11B, although some Chinese sources claim the Type 120 lacks heightfinding capability, which is consistent with the LSS-1 design. Operationally, the Type 120 performs a similar role to the Russian 76N6E Clam Shell series, the latter typically deployed on a 40V6M mast system. Other than fundamental differences in radar designs, the Type 120 has much better mobility but inferior coverage footprint in comparison with the Clam Shell system. It is likely that a Type 120 would be colocated with a Type 305B, both feeding target track data to the Command Post controlling a cluster of HQ-9 and/or HQ-12 batteries. The Type 120 would provide frequency diversity, and extend radar horizon coverage for low flying targets such as terrain following aircraft and cruise missiles. Detail of Type 120 planar array antenna and turntable (via Chinese Internet). Aft view of Type 120 fully deployed. Note the hydraulically deployed stabilising supports and open equipment cabin (via Chinese Internet). Fully stowed Type 120 (via Chinese Internet). Above, below: Type 120 with antenna partly deployed (via Chinese Internet). Type 305A phased array acquisition radar deployed, in the background to the right for comparison the frequency scanned planar array Type 305B, based on the YLC-2V. The van parked behind the Type 305A radar head vehicle, also on an NG 80 chassis, contains the operator stations (© 2009, Bradley Huang). 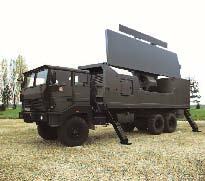 The new Type 305A 3D acquisition radar is unique and does not resemble any known Chinese radar designs. 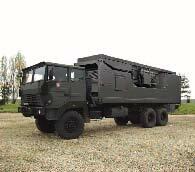 It is carried on the same Mercedes-Benz NG 80 derived chassis as the Type 120 and Type 305B radars. 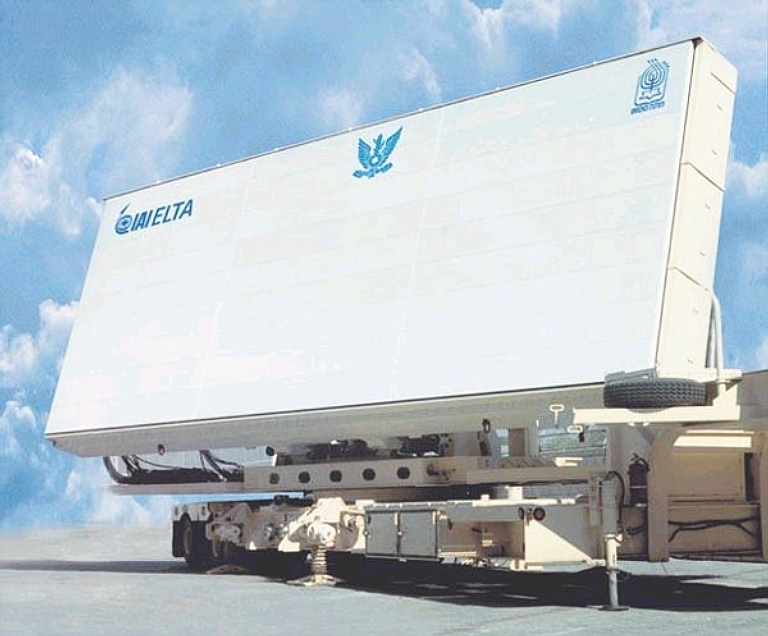 The antenna design physically resembles existing Western S-band AESAs such as the Thales Ground Master series, or the very much larger Israeli IAI/Elta EL/M-2080 Green Pine ABM radar series. The depth of the primary antenna and its structural frame is typical for AESA designs in this category, using a stacked modular feed network arrangement; this is well documented in a number of Russian AESA designs. The rear face of the antenna frame is largely occupied with voluminous equipment housings, of similar depth to the antenna frame itself, and of equal height. These would be consistent with the installation of low voltage AESA power supplies, cooling equipment, receiver, and exciter hardware. 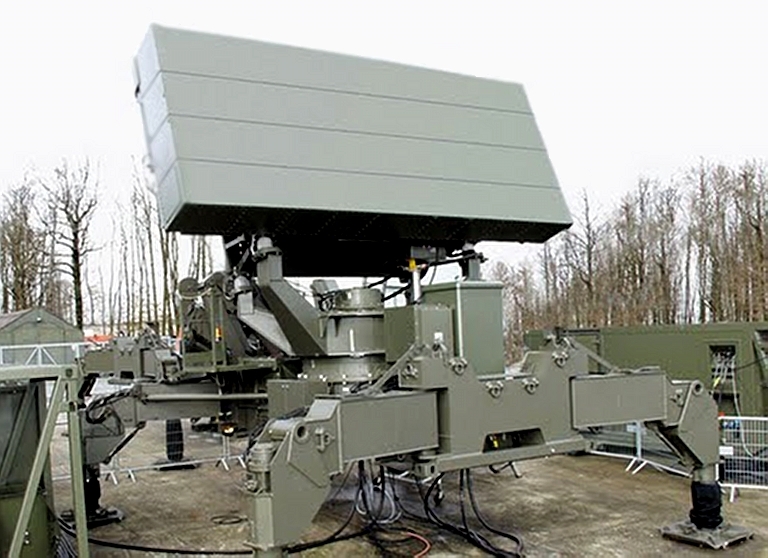 China's industry has previously designed and built large AESAs, specifically for the KJ-200 and KJ-2000 AWACS projects, operating either in the L-Band or S-Band, so the basic technology is available to construct a ground based radar in this category. 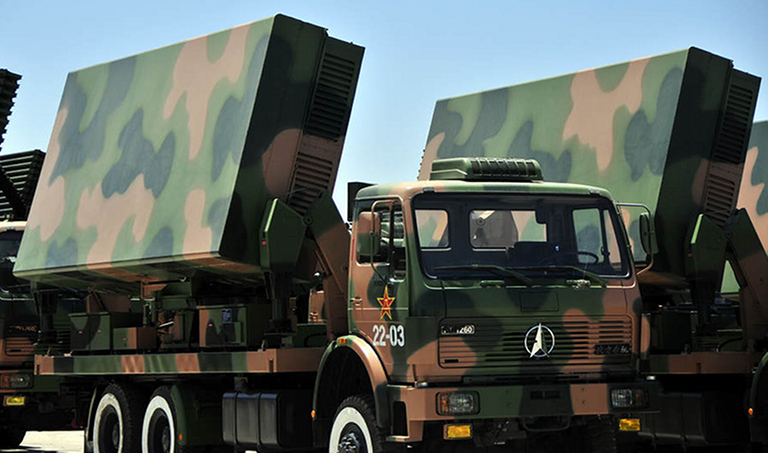 Chinese sources have identified the radar as a long range 3D high altitude acquisition and search design, intended to support missile guidance applications. This type of functionality is consistent with a number of extant dual role acquisition radars, built to support long range acquisition of aerial targets at medium to high altitudes, and acquisition of Tactical Ballistic Missile (TBM) category targets. 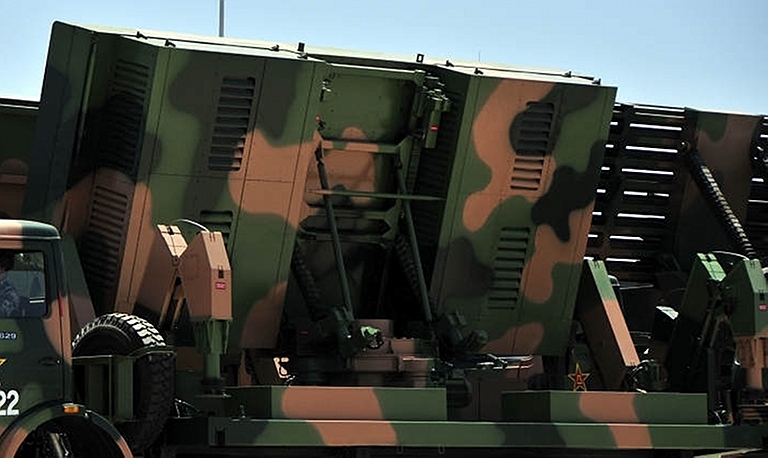 In recent years claims have emerged of an intended ABM or ATBM role for the HQ-9, but no evidence of a suitable acquisition radar for this purpose was ever provided. If the Type 305A is what it appears to be, then it would be the kind of radar required for a ATBM acquisition capability. Until further disclosures are made, deeper analysis of the Type 305A would be largely speculative. 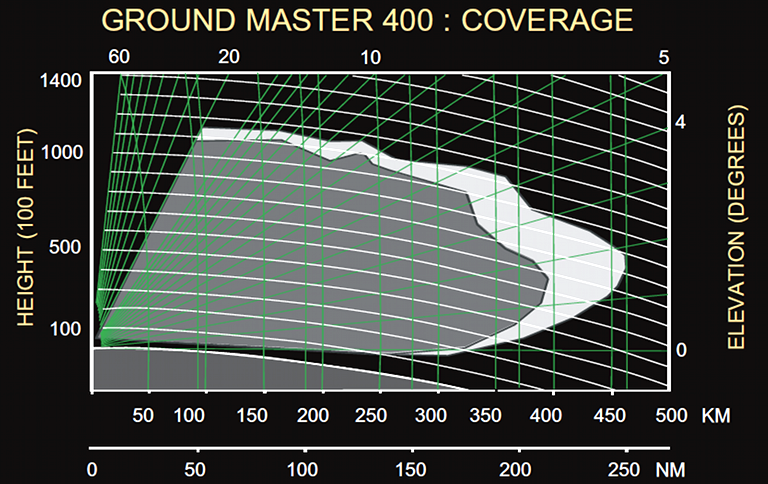 Performance envelope for Thales Ground Master 400 S-Band AESA acquisition radar. The Type 305A appears to be modelled on the self-propelled variant of the GM400 ,  (Thales). Detail of antenna face, deployed (via Chinese Internet). Above, below: aft view Type 305A antenna, deployed (via Chinese Internet). Detail of antenna mounting and turntable (via Chinese Internet). 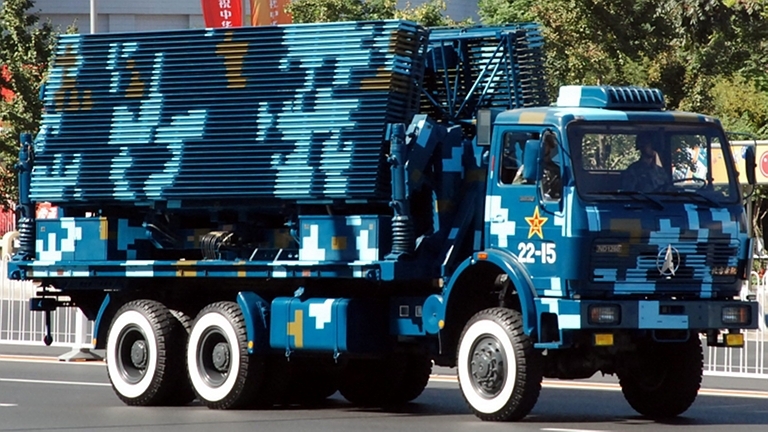 Above, below: Type 305A fully stowed (via Chinese Internet). 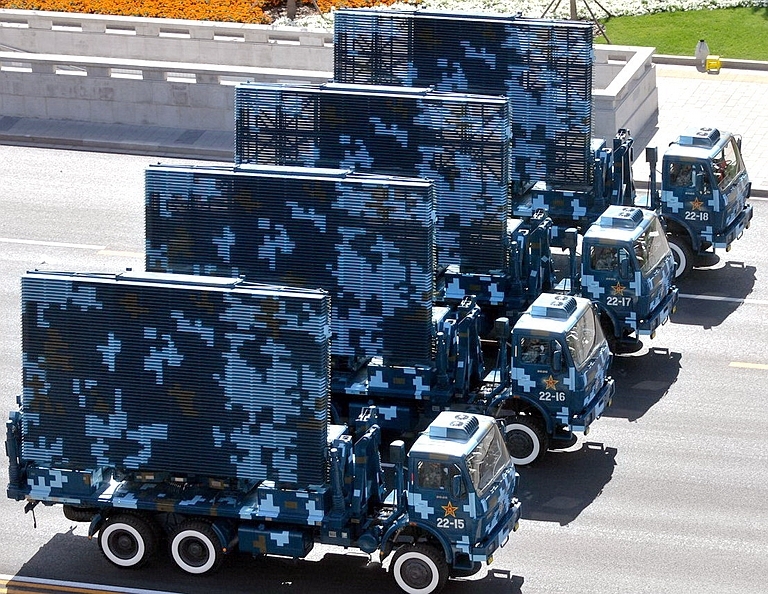 Above, below: Type 305A systems with antennas deployed (via Chinese Internet). 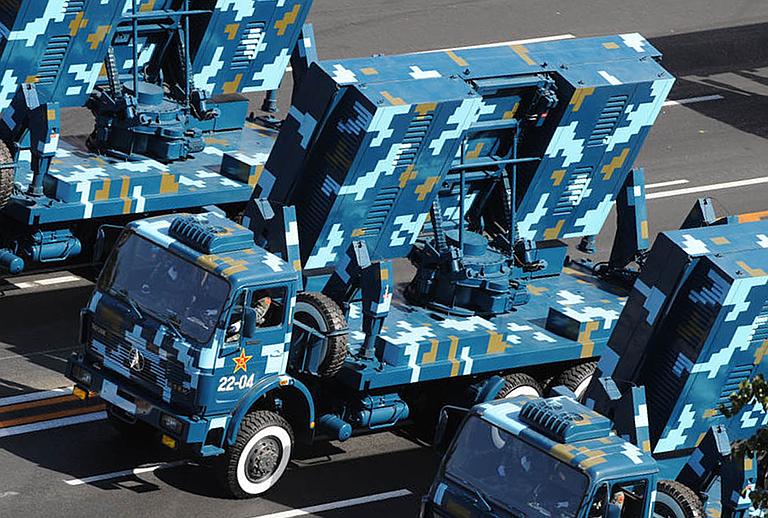 Type 305B systems with antennas deployed (via Chinese Internet). 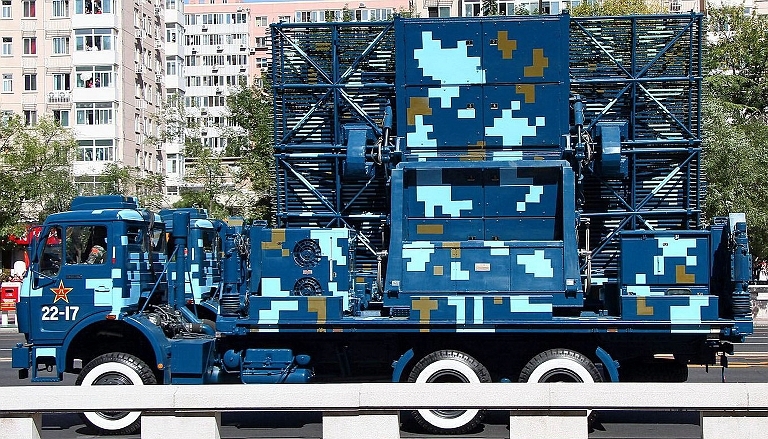 The Type 305B 3D acquisition radar appears to be a variant of the existing NRIET / CEIEC / CETC YLC-2V, which has been photographed as part of a HQ-9 battery, and has been reported as employed to support up to four HT-233 engagement radars, each with four TELs. 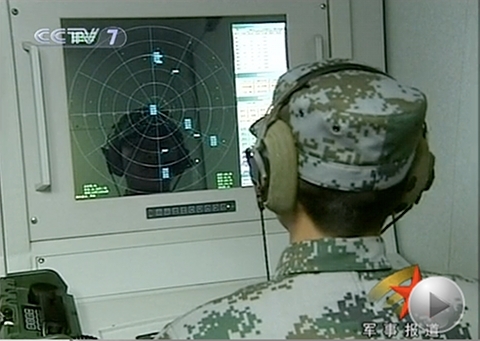 Chinese sources describe this radar as optimised for search and acquisition of aerial targets. The principal distinction between the established YLC-2V and the Type 305B would appear to be the absence of the IFF/SSR array mounted across the top of the antenna. The YLC-2V employs a single 6 x 6 truck carrying the antenna head and turntable, which is hydraulically deployed, and three additional 6 x 6 trucks carrying cabins for electronics and operator stations. None of the latter were displayed with the Type 305B antenna systems. The hydraulically folded antenna used with the Type 305B has 58 element rows and will employ frequency scanning like other radars in this family of designs. Row spacing suggests S-band operation, like the YLC-2V. 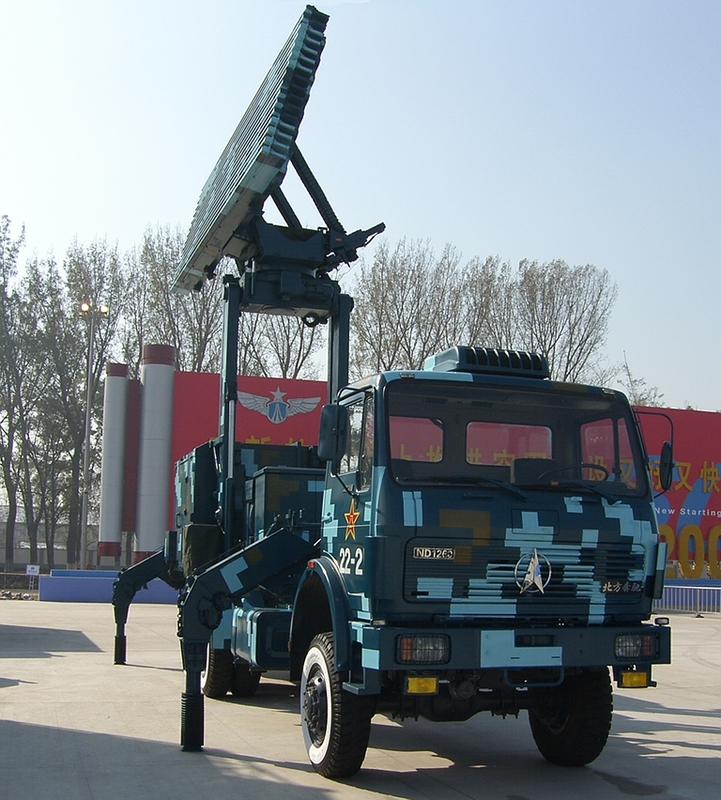 Aft view of Type 305B antenna (via Chinese Internet). Stowed Type 305B system (via Chinese Internet). Refer Cong Tianxian kan leida jiantan gongda yuebing leida’, Bingqi Zhishi, 2009 Niandi, 12A Qi, Zhongdi 287, p. 67; translated by Dr Martin Andrew.